The common halo observer in Central Europe will associate the term “Lowitz arcs” with short segments below the parhelic circle which connect the parhelia and the 22° halo. These so-called “lower Lowitz arcs” were first documented by T. Lowitz in St. Petersburg in 1790. In 1911, A. Wegener pointed out the hypothesis that these arcs might be caused by plate crystals oscillating around their equilibrium position. This statement is recorded in the classical textbook by J.M. Perter and F.M. Exner . In contrast this, R. Greenler postulated that plate crystals might perform full 360° rotations as they fall, referring to a note from R.A.R. Tricker from 1972 . Even today it is still under discussion which kind of crystal motion does occur in nature, since the Lowitz arc simulations for both assumptions coincide in their celestial position and differ only in their intensity distribution . A couple of years after Greenler´s theoretical predictions, the middle and upper Lowitz arcs were observed and photographed in nature, e.g. 1985 in Knau, Thuringia, East Germany , 1988 in Dover, Delaware, USA  and 1994 in Vaala, Finland . These observations were, however, not inspired by theory, as the arcs were identified only afterwards by comparison with the simulations. In the records of the German “Sektion Halobeobachtungen“ and the later “Arbeitskreis Meteore e.V.“, the upper Lowitz arc was categorized as “unknown halo“ or “abnormal Parry arc“. E. Tränkle presented a simulation of this arc independent from Greenler in 1995 . It is less known that apart from this family of “22° Lowitz arcs” (named this way since they are produced like the 22° halo by a prism wedge angle of 60°) another group of “46° Lowitz arcs” can arise from refraction at 90° wedge angles. This is because, on the one hand, they occur even more seldom than the 22° Lowitz arcs in nature. On the other hand a historical nomenclature muddling has caused some confusion. In short, the story runs as follows: By the middle of the 19th century it was still unclear how the halo which we know today as circumzenithal arc (CZA) is formed. Competiting hypotheses were pointed out by G. Galle  and A. Bravais . In the end it turned out that Bravais was on the right track. 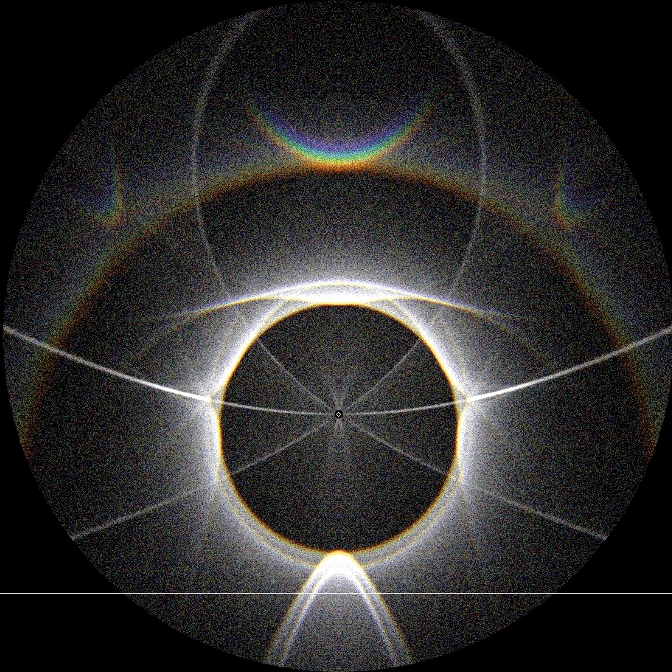 According to his theory, the CZA from plate crystals with vertical axes is not a true “upper tangent arc“ to the 46° halo, as both these halos meet only for a single solar elevation (~22°). In contrast to this, Galle assumed an oscillation of the crystals, and Pernter later calculated from this starting point a real upper tangent arc to the 46° halo, together with a lower tangent arc and the equivalent of the circumscribed halo for high solar elevations . The assumed crystal orientation is indeed identical to the one which was believed to cause 22° Lowitz arcs. This way, “Galle’s arc“ or the “upper 46° tangent arc” became part of the halo lore , without a single unequivocal observation in nature until 2006. Each ray path can contribute up to 2 arcs, however, the contributions from paths 3 and 4 do always overlap. If one puts aside the subtle difference between the oscillating and rotating crystal motions for the moment, the halos from paths 3 and 4 are exactly the 46° tangent arcs predicted by Galle and Pernter. Similarly to these, Greenler’s contact arcs were nothing more than pure theory at their time of publication. Nonetheless, it was already quite obvious that Lowitz-oriented crystals must produce a much more complex scattering pattern than only two tangent arcs outside the 46° halo. 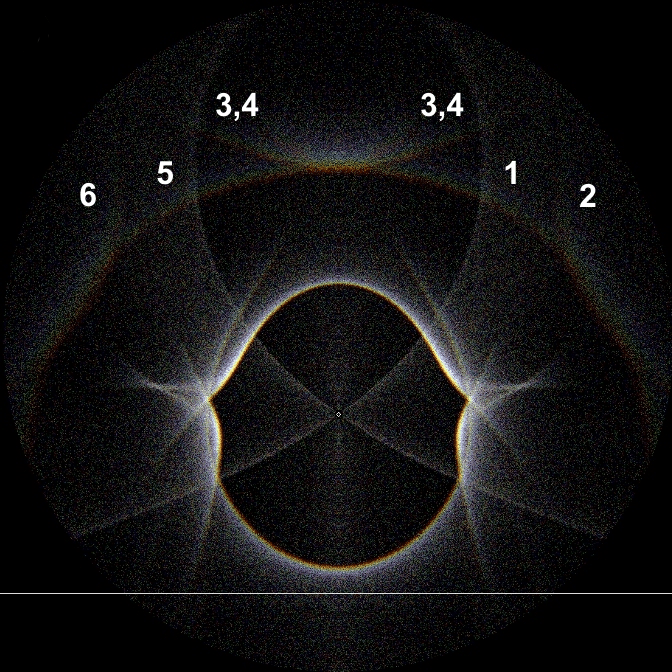 It is, however, not useful to consider the contact arc ensemble a single halo type, since the various ray paths can contribute to the overall display with different efficiencies depending on the crystal shape. Such effects have already been discussed by M. Riikonen et al. 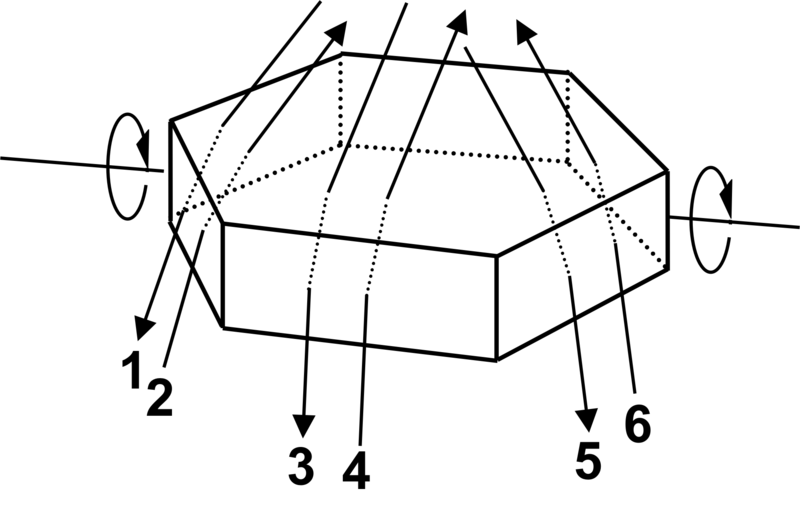 for 22° Lowitz arcs by comparing hexagonal and rhombic crystals . A search through standard literature and halo reports available from the internet revealed that prior to this display only very few other photographs of 46° Lowitz arcs had been obtained. On Oct 26th, 2006, near the Finnish town Muonio, P. Linnansaari photographed during a diamond dust display a remarkable intensity increase around the top of the 46° halo, which appeared clearly separated from the SLA/CZA junction due to the low solar elevation. Later comparison with simulations revealed that three neighboring 46° Lowitz arcs were responsible for this effect, with the middle one corresponding to Galle’s arc . Moreover, there is a report from J. Ruoskanen, who could photograph 46° Lowitz arcs generated by a spotlight on Jan 1st, 2009, in Hyvinkää, Finland . The first known photograph of 46° Lowitz arcs apart from the top of the 46° halo was recorded by A. Kirk, Sept. 13th, 2012, in California . However, in the latter case, strong image processing had to be applied to render the arcs visible. With T. Klein’s photos from the Miesbach display, this very short list was extended by a further entry. Furthermore, they constitute the first documentation of 46° Lowitz arcs from Central Europe. The analysis of this display turned out to be a welcome opportunity to revisit lesser known chapters of halo history. Galle did certainly not explain the CZA with his theory from 175 years ago, but instead opened the door to the broad variety of 46° “contact arcs”, which were then theoretically explored in their full extent by Greenler about 35 years ago. The open task for the recent and future generations of halo observers will be to get a better understanding of the Lowitz orientation itself: Do the crystals actually perform full 360° rotations, or merely oscillating motions around equilibrium positions which correspond to the classical plate and Parry orientation? J.M. Pernter and F.M. Exner, „Meteorologische Optik“, Wilhelm Braumüller Universitäts-Verlagsbuchhandlung, 2nd edition, Wien, Leipzig 1922, pp. 368-380 and pp. 410-416. R. Greenler: „Rainbows, Halos, and Glories“, Cambridge University Press, Cambridge, New York 1980, pp. 44-47, pp. 58-61. G. Galle, „Ueber Höfe und Nebensonnen“, Annalen der Physik und Chemie von J.C. Poggendorff 49, pp.1-31 and 241-291, 1840, relevant pages from p. 261 on. A. Bravais, „Mémoire sur les Halos et les Phénomènes Optiques qui les Accompagnent“, Journal de l’École Royale Polytechnique, Cahier 31, Tome 18, S. 1-280, 1847, relevant pages from p. 91 und p. 244 on. – G. Dietze, „Einführung in die Optik der Atmosphäre“, Akademische Verlagsgesellschaft Geest & Portig K.-G., Leipzig 1957, p. 74. – D.K. Lynch, „Atmospheric Halos“, In: „Atmospheric Phenomena: Readings from Scientific American“, W.H. Freeman and Company, San Francisco 1980, p. 128. – Minnaert, „Licht und Farbe in der Natur“, Birkhäuser Verlag, Basel 1992, p. 271. – Tape und J. Moilanen, „Atmospheric Halos and the Search for Angle x“, American Geophysical Union, Washington 2006, p. 27. M. Riikonen, L. Cowley, M. Schroeder, M. Pekkola, T. Öhman und C. Hinz, „Lowitz arcs“, Weather 62, 252-256 (2007). – Riikonen: Halot: Jääkidepilvien valoilmiöt. Tähtitieteellinen yhdistys Ursa, Helsinki 2011, pp. 71-73. This entry was posted in historic halos, theory. Bookmark the permalink.